Michael Vick was a legend both on and off the field. College Football has seen its fair share of transformative quarterbacks, but prior to the 1999 season, the game had never seen something quite like Virginia Tech’s Michael Vick. Born and raised in Newport News, Virgina, Vick grew up in the rugged Ridley Circle Homes housing projects. Despite the crime, poverty and other societal ills that surrounded him, Vick’s inner voice would often tell him that there was more to experience in life than just what his immediate surroundings offered. As a boy, he would escape into his thoughts and inner visions with a fishing pole in his hand. “I would go fishing even if the fish weren’t biting, just to get away from the violence and stress of daily life in the projects,” he once told the Newport News Daily Press. His other escape was the oasis of the neighborhood’s athletic fields. The stories of his youth football exploits ricocheted around the Tidewater region. His performance as a high school freshman, once throwing for over 400 yards in a game, gave credence to the fact that his skill set was beyond special. Enticed with the idea of playing quarterback at Syracuse while following in the tradition of its accomplished African-American signal callers like Don McPherson and Donovan McNabb, Vick chose to stay closer to home to attend Virginia Tech. And after spending a crucial redshirt season learning the game and getting acclimated to the rigors of the overall college experience, he made his college debut in 1999 by utterly obliterating all previously held notions of what a quarterback could accomplish. Not only did he dazzle with exceptional performances, but his stylistic essence pulsated with flavor and a smile that was irresistible. It’s hard to define “Cool”, but you know it when you see it. My man was operating on an entirely different level of smoothness, bringing some James Bond meets Cyrus from The Warriors meets Han Solo meets Big Daddy Kane meets Black Belt Jones meets The Five Deadly Venoms meets Rakim meets Shaft meets Youngblood Priest type of ridiculousness to the way he unleashed 80-yard rockets at the flick of the wrist, or sliced and diced his way through defenses with his world-class speed and mind-bending, Barry Sanders-like bursts in the open field with his feet. In his debut game, he played slightly more than one quarter but ran for three touchdowns, including one which was a spectacular flip over a defender to cross the goal line. He proceeded to lead the NCAA in passing efficiency, won the Archie Griffin Trophy as college football’s most valuable player, was a Heisman Trophy finalist and led the Hokies to an undefeated season and a birth in the national championship game against mighty Florida State. Virginia Tech lost 46-29, but one couldn’t help but marvel at how Vick, who accounted for 322 yards and two touchdowns, shocked and amazed against that incredible Seminole defense. We haven’t seen anything like him on the college landscape in a long time. He simply changed the game in opening up an entirely new construct of what a signal caller of his ability could mean to an offense. We’re just now beginning to see a reasonable facsimile of his play in the remarkable brilliance of 2016 Heisman winner Lamar Jackson. 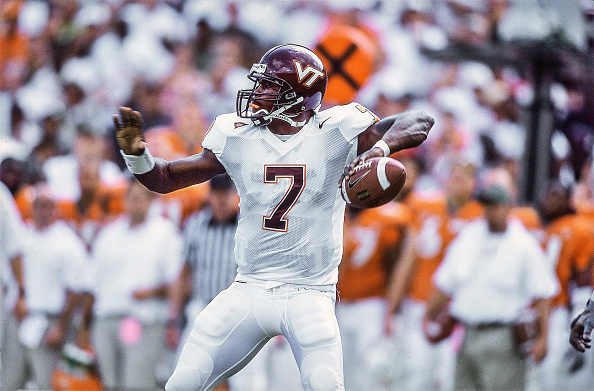 Michael Vick, whose jersey was retired in 2002 and was recently inducted into the Virginia Tech Sports Hall of Fame, was simply one of the most remarkable and exceptional players that college football has ever seen. After watching him, you always walked away greedily wanting more. Along with a lingering, uneasy, supernatural feeling that it was physically and scientifically impossible for him to do the things he actually did, thinking that perhaps your eyes somehow had the capacity to lie.